You will notice through the chapters that information may seem advanced. This is a note basically towards the target audience of my thesis. Back towards the beginning, there were those such as Attorney Mark Lane who was hired as attorney for Lee Harvey Oswald, and the first authors of the first books about the assassination and their audiences. I was of the age as like the younger brother or a young nephew in comparison. In short, those alive at the time as the national audience through the several years afterward have experienced original news and publication. These are the foundation in the majority belief that the Warren Report of the President's Commission on the Assassination of President John F. Kennedy did not present or report a full investigation, and the original suspicions of a national cover-up were born. My message to all those born later in time and now learning of all this, and particularly how important this event was as affecting our nation and world through today, is to begin to breeze over the general news and stories and views. You will see the basic preliminary doubts and disputes arisen. You will then see and understand the references and points that are being made here in this thesis. 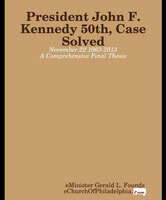 Of course the Warren Report itself is the basic introduction to the assassination of President Kennedy. And this note about my fact-finding and research. As a member of the audience described above combined with the several years of discipling in the Word and Gospel of God in subsequent years which included then posting Bible studies, the 50th anniversary of the assassination was upon us all and still not case closed. About year 2010 I began to research on the Internet the many well known researchers and the facts and documents appearing at credible and responsible websites and sources. I wanted to take that one final look with the idea that this must be able to be solved. Of course that quest has led even myself to the astonishing revelation of facts and to a most surprising conclusion that I have made - one not considered and precariously absent in others work and publications. I have only to thank those of courage that were the treating physicians and the many witnesses and the vast majority of Americans that were appalled, aghast, and in disbelief - almost as taking an oath to never give up until the culprits are caught and the conspiracy known. As well, all of the relentless fact finders and researchers who continue to pursue unto and until "case solved" and officially case closed. Above all, I give that credit to God and gratitude for his forgiveness of a sinner with his gift of knowledge and understanding and wisdom and that of his enlightenment. It is imperative you understand who the man is named as the head of the conspiracy. You will needs be taught by a Christian Minister of God able to teach the prophecies by interpretation, and I am one. This man is mentioned, a biblical figure, in the Holy Bible severally and most prominently in Revelation, the last chapter of the Holy Bible - the Authorized King James Holy Bible (only approved English language distribution, copyrighted in the Public Domain United States). I will produce the studies (free) concerning this in the next ebook and is part of my trilogy of works as the third being titled: JFK "Girlfriend" Assassinated, Marilyn Monroe. I only hope this first ebook work will be coupled to a book or paperback release and ultimately made into a movie of approval, as I can not produce that presently. Perhaps my sharing will encourage more. In revisiting the assassination events such as all the controversies over Lee Harvey Oswald, the suspicions of some of the Dallas Police Department in complicity, Jack Ruby being suspect of a larger conspiracy and so on - my beginning research led me to anything available concerning the head wounds of the President. It is quite remarkable today to see the several wounds in plain sight of all, and to find that only the few saw these originally and knew about them. As you have seen in the Warren Report - these were hidden from the public. I will begin from all firsthand Medical Testimony that described at least three entry wounds of the President's head. # FIRST ENTRY Wound was the carbine type hole about the size of a pencil hole - in the top rear of the skull, about above the massive hole towards the right - above this and more centered. This entry wound was like about the size of pencil or slightly larger it would make as stuck into a watermelon as example. The exit wound of this entry wound was obliterated by the virtual simultaneous second exploding tip shot - virtually completely. # SECOND ENTRY Wound from the front and right side approximately above the forehead obliterating the exit wound damage from the first shot. The entry wound damage of this second shot is consistent with an exploding upon contact type projectile round - see 'scalp/cap flanges fingers' skull flaps medical evidences of the frontal wounds. Reported as only possible via an exploding tipped projectile round which causes the fingers like blow out. ADDITIONALLY: Please watch all 8 minutes of this video by JFK Researcher, Bob Harris. MY COMMENTS: Hello Bob. I believe you have an end of a mystery concerning the path of the third bullet hitting JFK's head from the front causing the "rear blow out wound" described by Doctors as about the size of a tight clenched fist about the below-center-right side of the back of JFK's head. IMO [in my opinion] there were three rounds that hit JFK's head almost simultaneously, almost. First hits from rear causing neat entry wound about size of a pencil puncturing not tangential apparently, head juts forward Z312/313 [Zapruder Film Frame 312-313]. Almost simultaneously a second round as exploding tip hits from front and right (Knoll area), massive blood. The third round you have captured here in your vid shows the third round coming from front to back from overpass area, and then the pinkish wound part and missing hair appears with the blow out exit wound in the rear of JFK's head. I believe this then is that mystery as this is very much like a "gutter wound" and described well with pictures at PatSpeer.Com Chapter 16b Digging in the Dirt. The normal type gutter wound is a shot that creases the skull as like a grazing wound but deeper. 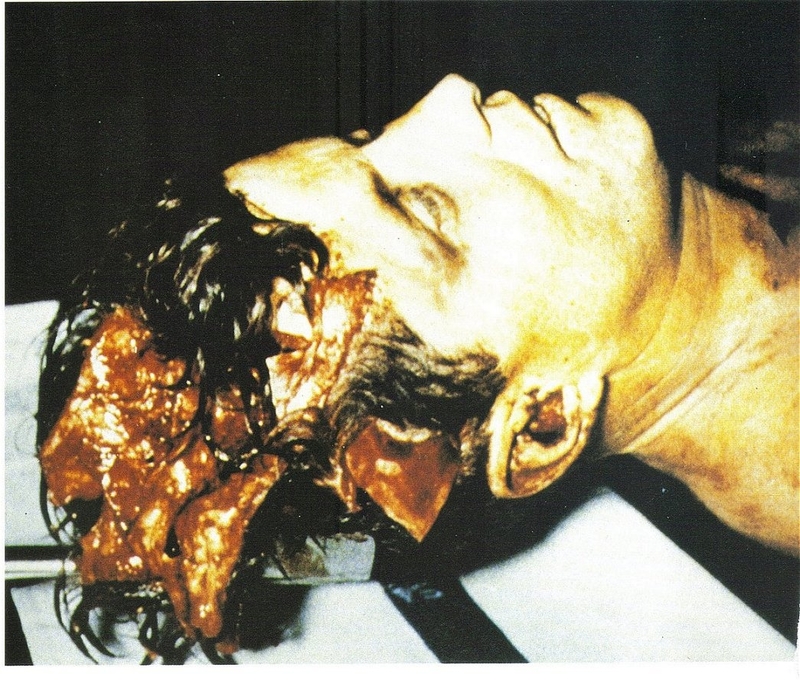 The third shot then to JFK's head as a gutter shot in some vein is not creasing skull, but brain matter (pinkish part appears) and then exits the rear of the head causing the exit wound described by Doctors and commonly called the "rear blow out wound" in forums - about the size of a clenched fist hole on the back of JFK's head - somewhat to the right and some what down from center. +REVISION: I am adding this comment since published that this without doubt is showing the "gutter wound" of the President and by witnesses - and that it is impossible to have been caused by the shot from the rear reported from Lee Harvey Oswald's rifle which was a normal neat puncture wound entry from a military style carbine rifle seen on the rear of the President's head. The Warren Report, in simpler terms, would have to claim that both the massive wound on the front and right of the President's head called exit by them and then the gutter wound on top of that were caused by the same bullet as newest magic bullet theory. The second shot obliterated the exit wound of the first shot virtually simultaneously. The entry wound of the third shot from the front causing the rear blowout exit wound evidence was mostly lost with all other via virtually the entire missing brain of the dead President arriving at Bethesda for the autopsy. Entering third into the already damage from the second exploding shot simultaneously after - it entered this damage as making any entry wound, but in the obliteration of damages already. These occurred a split partial second apart - almost simultaneously - and in their prearranged specific order, in the obvious exact order as the rear carbine wound first and then the second explosive tip projectile round from the front and side second, and then the carbine shot from the front thirdly. There is obviously no other possible order of shots as the direct medical observation as the attending doctors has been testified to and reported on in interviews and sworn court testimony. These are the Attending Doctors descriptions of the wounds of the head that President John F. Kennedy suffered. Let's take an early look at some of the JFK head shot videos. This is a two part, 10 minuts each, simulated video of the deadly head shot. Although there is not the graphic real video footage of the President being wounded, still caution should be observed as to viewing the graphic type simulation and verbage. The host is Sixth Floor Museum longtime curator Gary Mack, influenced no doubt by his posistion at the Museum which is heavily reported as pro-Warren Commission. Seeing past that, one fair part shows the "Badge Man" did not fire any style rifle as Oswald's reported weapon - start at the 8 minute mark. It would have an exit wound out the left side of the President's head and struck and most likely killed Jackie Kennedy too. If you will please notice the exit wound which does appear as the real exit wound size hole on the President's rear of his head (3rd shot) - towards the right and lower down towards ear level and lower. This is generally called the "rear blow out" exit wound from a type rifle as Oswald's reported murder weapon that would have come from the triple overpass area. Note that there was also the neat puncture entry wound small pencil sized hole above and to the right of the "rear blow out" exit wound (1st shot). This is the pure bullcrap piece. The comparison is so pathetic of the reported Oswald head shot. The simulation shows lots of bone fragments blowing forward into the car from the rear shot. The Zapruder film of the real shot only shows the spray of matter with virtually no bone fragments. This proves my thesis here of the triangulation three shots. The first shot from the rear was met instantaneously after by the exploding-on-contact 2nd shot from the retaining wall on the Grassy Knoll from the front and right which obliterated all exit material on contact. The third shot, an instant later, from the front exits the rear causing the "rear blow out wound" Parkland Doctors reported as about the size of a small bunched up clenched fist. Once again WC people prove it is a lie and this time with a fairly excellent simulation materials project. 3 Timed Shots - How ? When considering all the evidence that Lee Harvey Oswald was expressly set as the "fall guy" for the JFK assassination, and as conspiracy proved revealing the partial role of Oswald, their version of truth has to be that the head wounds of President Kennedy had to be from the rear - or obviously more than one shooter would have been revealed. Follow this through. They had Oswald's rifle and three shells in the building, or considering the Mauser rifle testimony and/or reports - Oswald's rifle was in the least 'waiting in the wings' to be presented as the murder weapon. Various cameras were being confiscated immediately after the shooting. Others developed were returned damaged. The "money" went on the Zapruder Film and additional testimony of head movement as reaction to the rear shot much later (rear shot hit brain nerve that forced the head forward then backward). If the three shots went amiss as out of order in the exact time they hit the head, the entire "contract hit" was fatally erred and would obviously reveal a conspiracy as more than one assassin. How could they "time it perfect " ? The "triangulation hit" ? A visual sign like "Umbrella Man" - No, you can't aim through a scope and look at him at the same time for such the exact precise timing of the three shots. Maybe a radio device and ear plug and a beep audio signal ? No, the reaction time could vary greater and greater above one person, and here three at least, to this stimulus signal by hundredths to tenths to even half to a full second later of pulling the trigger upon any audio signal to fire - or yelling "now !" - by more than one shooter which there plainly were according to the Attending Physicians at Parkland Hospital and the President's body itself. They needed ELECTRONIC FIRING PINS as opposed to the traditional physical firing pin. The gun hammer ignites the powder. This can also be done by an electric current of the right amount of amperage to ignite the powder. We now have electronic firing pins in three weapons. These can be set to any timing for firing to the thousandths of a second apart and any amount of guns and in any order 1,2,3. But, this can be done wirelessly by one person!.... all the shooters have to do is aim the weapon and the wireless trigger man hits the button- causing the firing order of the three weapons 1,2,3 as a hundredth of a second apart in order 1,2,3 - a hundredth of a second apart as example of the exact timing it was. "....Electronic firing refers to the use of an electric current to fire a cartridge, instead of a percussion cap. In modern firearm designs, a firing pin and percussion cap are used to ignite the propellant in the cartridge and propels the bullet forward. Because the firing pin must travel a short distance, this creates a short delay between the user pulling the trigger and the weapon firing, which generally decreases accuracy. In an electronic-fired firearm however, an electric current is used instead to ignite the propellant, which fires the cartridge as soon as the trigger is pulled. Electrically primed small arms cartridges retain the primer which functions in the same way as a conventional primer. Rather than being struck by a firing pin, or equivalent mechanical means, a small electrical current serves to detonate the primer which provides the thermal impulse necessary to ignite the propellant which then deflagrates, producing pressure. ...."
Now there is the one "radio walkie talkie guy" on the scene on the sidewalk area about after the first JFK wounds to the throat area. This radio as a two-way radio could be a minimum one quarter watt radio broadcast which would broadcast a signal a quarter of a mile or more. A wireless broadcast, a second or less, dead carrier (broadcast button on and no voice) would broadcast a wireless signal. If we take the two positions of the School Book and Dal Tex Buildings and then all the way down the picket fence to the overpass - we are looking at about well over a hundred yards. 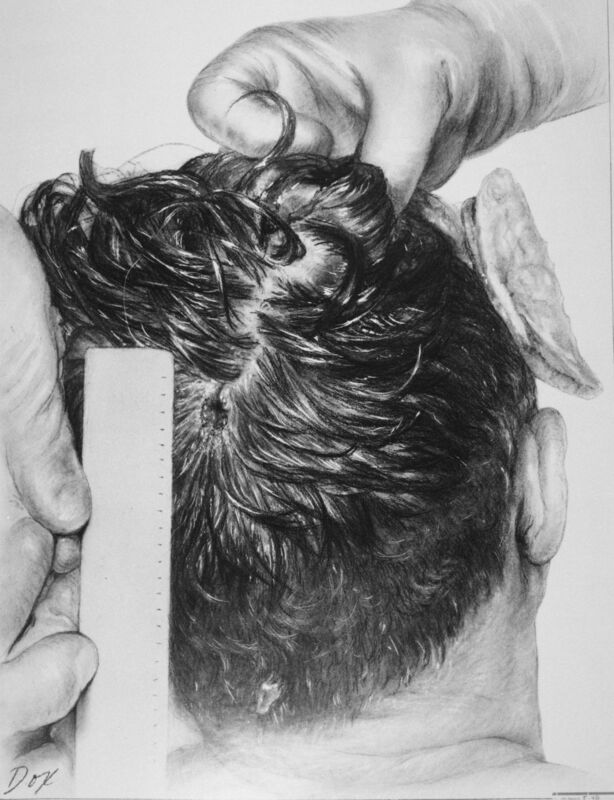 It is measured from "Oswald's layer" to the head wound as about 90 yards. You can throw in another 30 yards about to the Dal Tex Building and another 50 yards about to the fence down at the over pass area. So, the two furthest shooting positions apart are about 150 yards approximately. This is then the broadcast signal range/distance necessary revealing the wattage necessary to reach them. A common four watt citizens band radio walkie talkie broadcast signal will go several miles - up to even ten miles or more on line of sight without obstructions (buildings, trees, etc. ). The smaller one quarter watt two way radios obviously can broadcast a signal up to a mile away, same conditions - line of sight. Now the electronic firing pin in the three rifles being modified to receive and amplify a wireless signal induction voltage to the necessary amperage to ignite the powder of the rounds - these can be set to any time delay desired such as one thousandth or one hundredth of a second electronically - and for each rifle, to say they were set to shoot one hundredth of a second apart in succession as example of the actual time factor which can be precisely determined. And there you are. Each of the three rounds were set to fire in succession of each other - whatever the exact as one hundredth of a second apart as example. All the shooters had to do was aim the rifles - the rest was done by one electronic trigger man firing all three rifles practically instantly apart, no misses as time sensitive in their order 1,2,3. The first shot obviously had to be from the rear as obviously Oswald was already set up as the shooter of all three shots. It seems such the overkill or even the degree of paranoia by the conspirators that horribly they set up three rifles to kill the President. So violent and so the murderers they were guaranteed the "hit" in this manner. It is probable as opposed to speculative that the exploding projectile second shot was used obviously (in looking back retrospectively) because of the massive brain damage it could do upon impact. This allowed further destroying of the area to destroy bullet fragments and evidence. They needed Oswald rifle evidences and none else. If you will remember or research - the Attending Physicians at Parkland Hospital said there was only about "one third" of the brain blown away. That's not what was reported in the Autopsy. It was virtually all gone. Lastly, to the Public and even Warren Commission Members, the second exploding round damage to the front of the head appeared as what would be explained as an "exit wound" of the alleged fatal shot by L. H. Oswald. The average citizen having no practical knowledge of gun wounds - well everything seemed plausible. Any private citizen of any degree dispelling any of these lies could simply be made out as some self serving liar trying some new profitable book story - and did occur during the Garrison Investigation from New Orleans, publicly destroying personas. Obviously Oswald, or anyone, did not have the time to remove the wireless electronic firing pin panel insertion 'jury rig' that would be about the size of a cigarette pack but smaller - and replace all with the original hardware of the alleged murder weapon, plant it and run like hell without getting caught. Neither was the alleged Mauser 7.65 Rifle reported or seen with such the jury rig wireless receiver attached to the rifle. So, right. This moves to the Oswald rifle "ballistics confirmed" fragments found and that if Oswald's rifle was already planted in the Book Depository - then the fragments were planted as well as the "pristine bullet" found on the stretcher because obviously Oswald's rifle could not have been the murder weapon due to the Medical testimony of the Attending Physicians in Parkland Hospital Dallas because it did not have the Wireless Electronic Firing Pin "jury rig" attached to it and is ruled out as the medical testimony revealed three electronic firing pin coordinated fire weapons. And also, it is obvious the Electric Trigger Man wireless radio and all wireless receiver electric firing pins were set at a frequency that was not used by all the surrounding broadcasts as Police Radio, AM Radio Stations, HAM Radio, CB Radio, etc. - as any one using their broadcast frequency would have obviously fired the weapons prematurely - as obviously disastrously for them. As a sort of footnote is observing in a formal "retrial" if you will, that obviously all witnessing to the "three shots" will be legally impinged upon regarding as well the precluding testimony and evidence of this coerced and manipulated and ignored testimonies to the contrary whereby witnesses reported being told to "shut up" and "three shots is all you heard" and "you / they were mistaken" etc. This then includes same treatment as to the Oswald rifle evidences. Impinged Evidence and Testimony as meaning these will be isolated, set aside as corrupted and tainted. Note that in electronics, and I have a Certificate in Home Electronics and Equipment Repair, that there is what is called Band Pass and Band Block filters. You can set up any to receive any frequency you wish - blocking out all others. Now we all know there is the extremely tiny broadcast voltage signal in the air for Radio and TV - and now Satellite and Wi-Fi - and this tiny almost minute voltage signal is then amplified into the TV picture or like even to the loudest radio channel playing rattling all the china off the shelf at up to 250 Watts or even more. In automobiles the amplification is not supplied by plugging it into the house electric plug. It is from the 12 volt car battery which also gets amplified into up to 30 Amps or more (lots of juice). From a simple car battery and amplification of that voltage - it cranks the 20,000 volts running through spark plugs giving the electric spark necessary to ignite the gasoline. Any tiny voltage can be amplified into the greatest amperage and voltage you wish. The point is that a simple two way radio signal of tiny voltage - like even less than the current through a small flashlight bulb - can be amplified all the way up to the 40,000 volts into the picture tube that used to run in the age old Black and White Televisions, so that if it took up to say 2 or even 30 Amps (electric current, juice) to electronically set off the rifle/pistol rounds - it is that easy with a handful of electronic components and in this instance assembled in a very small electronic board attached to the rifle/pistol (Remington Fireball). The electronic board would be the size of a pack of cigarettes or even way less in 1963 as opposed to stamp size chips today. The argument that three rifles could have simultaneously fired by luck or plan at the same time and all hit as they did is lost in probability and odds as impossible and nonexistent with the preponderance of medical and military security evidence to the contrary and considering the nature of the homicide here and by who - as assassination of the President of the United States by, in the least, three shooters paid to do so with escape arrangements obviously as well and complete cover stories etc. Otherwise you would also have to explain and produce three "lone nuts" as Oswald to fit the "coincidence" that just all happened to pick the exact same very spot in the Parade Route and also at Dallas, and also the same date being November 22, 1963. The odds, again, of this are virtually non existent. But, having Oswald's incriminating "evidences" in place [rifle, bullet fragments, etc] then it is necessary to produce two other "lone nut assassins" and the evidences of that which goes into fringe lunacy I am sure.... in other words, Oswald's tale was told, prearranged, to the world as some Communist sympathizer in some manner - but as well likely emotionally disturbed, or even some traitor of some sort as being a "double defector" from two nations etc blah blah blah as the profile story of the "caught" assassin. Now you would need two other completely independent other "nut lone assassin" profile stories as to the Who, What, Where, When - they decided to shoot President JFK in the head in the Parade Route in Dallas on Nov 22 1963 to fit the whole theory that possibly three "lone nut assassins" happened to all show up in Dallas on the Parade Route in and about the same exact area and all at virtually the exact second decided to shoot at the exact precise spot ---- all completely independent of each other not knowing each other at all so that no conspiracy was/is possible, as the theory is based on the random chance three independent "lone assassin nuts" may have coincidentally shot at the exact same second randomly - to the contrary notwithstanding. The contrary of that is there were three in conspiracy and all shot at the exact same instant. The preponderance of evidence clearly showing the Conspiracy from evidence tampering etc as well as excellent testimony/report and visual evidence of Parade Route Security tampering etc. - clearly rules out any theory that there were several people as Oswald present simultaneously shooting being at least three head shots and at least one shot to the President's lower neck area. Additionally, the illegal gruesome act of the disposal of the President's brain matter en route reveals the foreknowledge of the explosive round projectile presumably with mercury evidence being removed as best possible by this most ugly criminal act thinkable as opposed to the idea that Oswald was being set up originally and two other happened to fire at the same time. There would be no need to dispose of evidence mentioned as Oswald's would be in place and any else found simply destroyed or later identified with other plants and real ones removed. This reveals their paranoia over getting caught by mercury evidence by an exploding tip round. It also reveals they had to frame Oswald and kill him for their version of case solved. In short, according to this theory of three shooters not knowing each other all showed up and fired at the same exact time - then the Secret Service [only ones in possession of JFK's body en route] and evidence "clean up crews" would have to have been notified like "I don't know how to tell you this but like one or two other shooters fired simultaneously and we've got extra evidence to clean up to avoid a conspiracy probe" . In other words - where and who reported to the Secret Service et al that "someone shot a mercury round exploding tip at the same time, believe it or not - and we gotta clean up!" Whoever possibly had that experience on site to make that assessment, being obviously critical to the cover up going on, indeed, by the Oswald teams being independent and without knowledge of the two other "lone assassin nuts" shooting.... They would have to be on the ground within the "kill zone" to ever be able to call up "mercury tipped exploding round fired/hit the President simultaneously - act accordingly in clean up of all things". No, again, the preponderance of evidence coupled with the nature of the assassination and by who of the President of the United States at such the time as just winding down, literally, from nuclear World War Three if the USSR had not backed down at the Cuban Missile Crisis places all "maybe it was a coincidence that three "lone assassin nuts" happened to ironically fire at the same exact second at the President's head hitting him fatally" is completely virtually nonexistent.